Jean-Marie Recamier at Camper & Nicholsons tells me he's sold the 26m motor yacht Solaria Too with no other brokers involved. When it comes to superyachts, Solaria Too is a timeless classic. 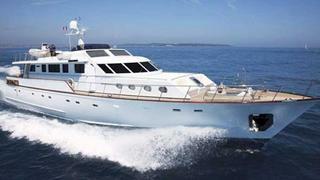 Designed by Andre Mauric and Jon Bannenberg, she was built in mahogany by France’s renowned Esterel yard in 1973. She sleeps eight guests in five cabins and her large deck spaces make her ideal for Mediterranean cruising. Solaria Too has the ideal ownership history, being owned for most of her life by the original owner and latterly by an experienced owner and lover of wood yachts.